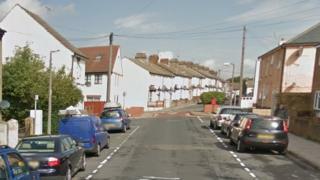 A man was stabbed and a woman injured during an aggravated burglary in the early hours, police have said. The man was found in Gardiner Street, Gillingham, with "injuries consistent with a stabbing" at 04:40 BST, Kent Police said. Officers then found the injured woman at a property in nearby Skinner Street. Both victims are in their 20s, police said. A man has been arrested and is being held in custody. An air ambulance took the injured man to a London hospital, where he is in a stable condition, police said. The woman was treated at the scene by ambulance crews for minor injuries. Kent Police has appealed for information.